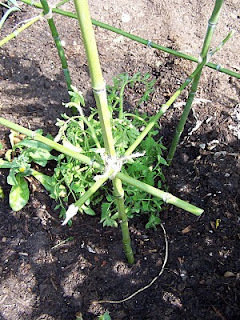 Tomato cages made of bamboo can keep your tomatoes off the ground and less available to pill bugs (AKA roly-poly bugs). 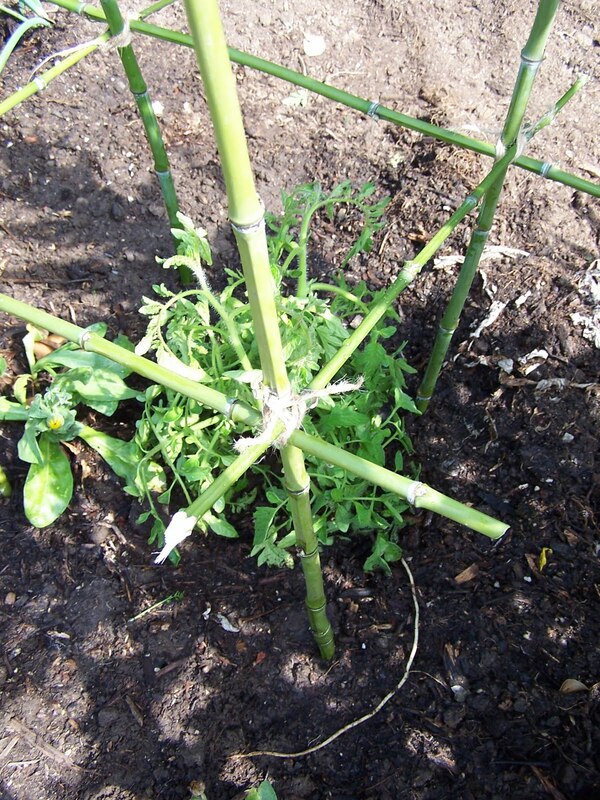 I've always wanted to grow my own tomato cages and bamboo is one way to do it. Saplings of weed trees (like Chinese elm or pepper tree, two of the candidates growing at The Learning Garden) can be used the same way-- tied together with some garden twine. There are a host of tomato cages you can buy, but this way is more environmentally friendly. Why not try it? The cool of Spring is likely to be a sweet memory before this month is out. It is time to host the proverbial summer garden party, sometime later this month. Longer days with a marine layer are nothing like the warmth of Summer and Fall, but the diffuse sunlight through the 'June Gloom' does make it warm enough to get your summer plants surging ahead. This growth time is important for a full harvest. If you can't get things in the ground this month you will not have the harvest you could have had. Besides, working in the garden in May is so much sweeter than doing all that back breaking work in June and July. Save yourself and your plants. Strike while May's picture is still on your wall calendar! I am planting the following from seed: corn, cucumbers (you can set out cucumber plants, but it is much faster and more certain to sow them directly. Just keep the snails at bay), squash of all kinds – summer, winter, zucchini, acorn – and beans – and setting out plants of basil, tomatoes, and peppers. I am still putting out lettuce seedlings and still sowing short rows of carrots, beets, radishes and spinach in one small area, with an old screen standing by to shield them from too much sun. Sowing all of those without the screen could be a recipe for disaster; even with the screen, it's a bit of a crapshoot, but then isn't that the essence of gardening? It is easier to grow cool season crops in the Summer on the coast than it is to do the reverse. One of my major goals in life is to grow a complete salad, meaning tomatoes with my lettuce. I have an annual tradition of the First BLT of the season, wherein, I grow the T and the L and usually bake my own bread. You can try planting the cool season crops in a shadier part of the garden if you don't have access to a screen and sometimes you'll be lucky, other times, not so much. I've done it both ways and like having my screen on hand. You may grow all of these in pots as long as you get smaller versions – most nurseries and all the seed companies will help you find plants that will grow in pots. It is possible to buy tomatoes and cucumbers bred to live in a hanging basket, but in our climate, think of all the attention you'll have to give their watering needs! While you can grow smaller varieties of sweet corn, it is a wind pollinated crop and important to grow a substantial number of plants to get a viable crop. Still, it sure makes a statement – even a small corn stalk is pretty impressive. It might be fun to do a Native American themed pot with a couple stalks of corn, a sunflower, and pole beans climbing up them. But don’t plan on it for a dinner party; it would be mostly a decorative piece. Pots, of course, do limit the size of a plant's root system, so you get less food. But if you don't have a choice in the matter, it is one way to add truly fresh food to your diet. Just keep a very close eye on their water needs. In addition, try melons, eggplant and okra, if you have room for melons and actually like okra and eggplant. Okra needs the most heat of any vegetable under discussion here. Put it the hottest corner of your garden. If your eating plans include the likes of borage, chervil, chives, lavender, lemon grass, lovage, marjoram, mint (be certain to get a good culinary one as there are many that are not) Greek oregano (Origanum heracleoticum NOT O. vulgare, big difference in taste although vulgare is a lot easier to find), parsley, rosemary, sage and tarragon, you could set these plants out into a border convenient to your kitchen. Or plant them in pots. These perennial plants are fine being planted now. They are hardy in the heat and will take a lot more drought than the annuals. These are all Mediterranean plants, which is the type of climate we have in LA. They are not as hardy as the California Natives. Our drought is typically nine months long, while theirs is closer to six, but they run an edible second. This is the second big season for planting perennial crops. While in Southern California, Fall is better, many people with East Coast or Midwest “roots” simply cannot prune from themselves this “Spring = planting time” mentality. It can be so pervasive that even nurseries themselves often evidence a better selection of some things at this time of year. Our part of the country seems so divorced from manual labor with the soil that such things are not the strangest occurrences that happen horticulturally here. Adding further confusion, a good number of the chain stores have their plant selections made somewhere back east by someone who has no clue what we should be growing here. You will find roots of artichokes, rhubarb, potatoes, onions, shallots, garlic and asparagus in many store. I'd skip these if you can discipline yourself. It is much better to purchase these from mail order suppliers. You'll get better plants and they will arrive at a better planting time, late fall and early winter, which is where I offer my ideas on planting them. One of my favorite suppliers, and fairly local too, is Peaceful Valley Farm Supply. Their website, GrowOrganic.com is not one of the easiest to use, but their paper catalog is fantastic. I have used it to teach organic gardening. Call them at 888.784.1722 and ask for the catalog. The main catalog comes out in January with seeds, tools and general supplies. The little fall catalog is the one that has these plants for your purchasing joy. Try some heirloom garlic and the Italian Red Torpedo onions for some real wonderful eating! But wait to buy them in Fall. You may put out deciduous fruit trees and fruiting vines, but they are best planted in Fall like the plants in the last paragraph. In Fall, you will have the chance to plant bare root trees which is easier on the tree and will help you get an established tree sooner (and therefore more fruit sooner!). The only thing you can find in the stores at this time of year are trees potted in 10 gallon or larger pots, but these are more expensive than the Fall bare-root plants, and they will not establish nearly as quickly as bare-root plants. It is much better to patiently wait until next Fall to plant deciduous trees. Now is a good time for citrus to go in as well as kiwi and sapote because they are more tropical and will love the coming heat while they get established. These plants do not go dormant so they are always sold in pots. Dig a hole no larger than the pot the tree came in, and do not bother adding all kinds of compost, mulch or other organic matter to the soil you fill in around the rootball. Current research shows that all that effort is pretty much a waste of time. Get the soil all around the roots and press it down with your foot in order to make sure it's firm. Put a garden hose on 'drool' and leave it be for as long as it takes to wet that are thoroughly. Keep citrus trees moist – especially in their first year – and soon you'll have more lemons, limes or tangerines than you know what to do with! Nature is always abundant if we work with Her and not against. In setting out your tomatoes and other vegetables, you'll want to choose the part of the garden that gets the most sun. We have all been told that all vegetables must have all day sun, but that isn't necessarily so. Even in dappled sun, or in areas that don't get sun all day long, I have grown tomatoes and peppers. Sometimes the crop yield is somewhat compromised and the fruits mature measurably later, but I've still had good eating from plots others said would not produce at all. One does invite more preying insects because the lack of sun stresses the plants a little more, but with a little vigilance and industry, those shortcomings can be mitigated. Tomatoes will set roots all along their stem, so setting them into the ground deeper than they were in the pot is a standard practice. However, other transplanted vegetables should be set in the ground no deeper than they were in the container. Allow one foot between peppers and eggplants, 2½' between most tomatoes – unless you know the plants are the short season early tomatoes – like Siletz, Stupice, Early Girl, Prairie Fire or Glacier, to name a few. These tomatoes are almost all determinate tomatoes that give you one crop in about 60 days from setting out and will set fruit in cooler/wetter conditions. They can be 18” apart and usually don't need staking. The other tomatoes do need something to keep them off the ground. If you find aphids on your plants, wash them off with a stream of water – at worst, hit them with a little soap solution. Unless one is gardening in deep shade or the plants are stressed some other way, aphids should only pose a minor problem and all one needs to do is to help the beneficial insects keep them in check. Keep a border or some pots of herbs or flowering ornamentals near the vegetable beds – beneficial insects may use their nectar for a food source when aphids aren’t present. I really try to avoid all pesticides and fertilizers-- even the organic ones. I believe in the old organic maxim to “feed the soil and not the plant.” The addition of all fertilizers and pesticides hurts the flora and fauna of the soil. If the soil has a healthy ecology teeming with bacteria and fungi, then this healthy soil will provide the building blocks for my plants to use in photosynthesis. Pesticides are designed to kill. Organic ones, in some ways, are worse than the chemical kind. Organic pesticides are wide-spectrum killers--killing almost any critter they touch. It is true they don't persist very long in the environment; which is one reason to use them instead of the chemical pesticides. But for any pesticide to be efficient, you have to spray enough to cause it to drip onto the soil and those drops are fatal to soil biota. Don't do it if you can help it. If you cultivate the ecology of the soil, you won't need fertilizers in your garden. It might take a few years, but with a little patience, you will raise the fertility of your soil. Plants that aren't thriving are probably not victims of a lack of nutrition (except nitrogen, which plants need in good supply at all times); it's probably a water problem (too much or too little). Plants in containers are in a different world. Those plants are placed in a most abnormal position. You must fertilize them – especially nitrogen. I use fish emulsion. It stinks, I know, I know – but it's still my favorite fertilizer. Apart from the odor, it is mild. Plants readily take it up and results are visible quite quickly. Even sickly plants can handle fish emulsion, whereas many of the other more powerful fertilizers are too hot for plants that are stressed and can keel right over when hit with the stronger solutions. I use all fertilizers diluted nearly twice as much as suggested on the container, even fish emulsion or other organic fertilizers. I would rather have a weaker solution used more often than a full strength solution recommended by the people that make their living off fertilizer sales. I mentioned nitrogen as being the one nutrient your plants need all the time. Signs of nitrogen shortages are yellowing older leaves on your plant. Because plants can move nitrogen inside their bodies, they will transfer their limited supplies of nitrogen from the older leaves, which don't work as well as the younger leaves, to their newer leaves in order to maximize the effect of the nitrogen. If your plant has green new leaves and yellowing older leaves, it's probably a lack of nitrogen. You see this frequently in citrus trees in the winter months, because nitrogen moves slowly in the soil and yet it is still needed. Fish emulsion is the answer for this problem. Summer time is a good time to get nitrogen into your soil Before May is out, I'll have stuck bush bean plants in everywhere I can through-out the garden. They are not large and they will 'make' nitrogen that can be used by subsequent plants. And the wonderful thing about this nitrogen is that it is free! Just like a cheesy mattress ad. All members of the bean family attract a special kind of soil bacteria to their roots with which they form a symbiotic relationship. The plant photosynthesizes nutrients it shares with the bacteria. The bacteria pierce the roots of the plant and so are able to feed off these nutrients. In return the bacteria can change nitrogen in the air into a form that plants can use. The roots of the bean plants always contain more nitrogen, so harvest your beans and when the plants are ready to give up, cut them off leaving the roots in the soil for the next season's garden. The only plant in our food gardens that should not be given lots of nitrogen are tomatoes. Left to their own devices, with any additional nitrogen in the soil, tomatoes will refuse to grow tomatoes and invest in making big beautiful plants. You can't eat the plants so it's a bum deal for the gardener. In cooler climates, that is a disaster because the cold weather will come before the plant burns up all that extra nitrogen and you can have tomatoes; in our glorious climate you will get them later and possibly not nearly as many tomatoes. Tomatoes need temperatures around 85º to set fruit and the bigger the fruit, the pickier they are about getting that 85º before fruiting. I usually don't even try big tomatoes this close to the Pacific – that cool ocean air prevents a good crops in most years. May is the last month to get your summer garden in. It's lovely outside – you want to be outside anyway – get out there and get busy! Waiting will make your job harder and the plants less happy. The time is now!